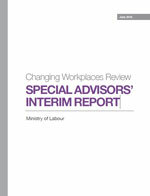 The long-awaited Interim report of the Changing Workplaces Review has finally been released. It’s well known in the labour law community that the Liberals have had the report for some time but only now, in mid-summer, right before long weekend, they have finally gotten around to releasing it. The unstated purpose, in my view, is to shock the industrial relations actors, especially employers, into turning a serious mind to the issues and contributing in a meaningful way to the discussion. Then, after reading follow up submissions, the CWR will issue a final report to the Liberals. I will focus on the Labour Relations Act proposals in this post, which is based on a quick scan of the document. Since many of the proposals support an expansion of collective bargaining, employers will almost certainly respond that the Ontario economy will collapse and millions of jobs will be lost if most of these proposals were enacted. Employers have argued that every time progressive labour law reform is proposed since the early 1900s. Expect nothing different this time. Unions will like some proposals but not others. And in the end, the Liberals will probably cherry pick a proposal here or there and reject anything that would be considered by employers to be a dramatic change to the industrial relations system. There is a slim chance the Liberals will surprise and usher in something truly innovative to help the millions of vulnerable workers who work outside of collective bargaining and also effective employment standards protections. The Report summarizes many of the submissions that have been made to the task force since public consultations began. I will leave interested readers to peruse the Report themselves. I may summarize various parts occasionally. But its August, and I have a book due by fall, so time is of the essence. I welcome any comments by readers and maybe we can build an interesting discussion board about the Report. – the possibility of returning to card-check based union certification that permits unions to establish majority support through documentary evidence rather the current mandatory certification vote model, which requires both documentary evidence and a ballot. Card Check was allowed from the 1950s until 1995, when the antiunion Mike Harris Conservatives introduced mandatory ballots. The Liberals re-introduced card-check but only for the construction sector. Unions win a lower percentage of certification application under the two-step ballot model than under card-check, so if the plan is to extend collective bargaining to more workers then card-check would be an obvious reform option. – easier access to first contract arbitration when collective bargaining for a first contract breaks down. – extension of successor rights to protect workers in services that are often contracted out, such as cleaning services and security. These provisions have all been effect in the past, so nothing revolutionary in these ideas. Unions tend to drag out the same ideas whenever we go through the exercise of considering labour law reform. However, there are some new ideas scattered into the report, including introducing electronic union certification ballots, which seems to make sense in 2016, and a new requirement to provide unions with a list of employees during an organizing campaign. I lobbied for this years ago on this very blog, noting that the current model, which requires unions to guess how many employees they need to organize is a ridiculous waste of time, money, and resources. The objective of the law is to permit workers to decide if they want collective bargaining. So what public policy objective is served by keeping secret the basic question of how many employees there are. The spectacle of a union’s application for certification being dismissed because it guessed the number of employees wrong makes a mockery of freedom of association. After the decision by the Supreme Court of Canada in Saskatchewan Federation of Labour v. Saskatchewan, (2015) S.C.J. No. 4 it is an open question whether concerted activity by non-union employees is protected under the Charter and whether it would carry with it a right to strike. I raised this very question in my summary if the Saskatchewan decision back in early 2015 (see especially the Issues for Discussion section at the end). The Interim report notes the possibility of introducing an American style Section 7 protected right to engage in ‘concerted activities’. I have argued in favour of such a move in the past, including in this paper called Graduated Freedom of Association. More revolutionary, and certain to attract a lot of discussion (and employer opposition) are the proposals for broader based collective bargaining. The “Baigent, Ready” model I summarized before is on the list of possibilities. As are other models that exist elsewhere in various forms, including a decree model (from Quebec) that permits government to extend the terms of a collective agreement to non-union workplaces within an industry. Adopt a model that would allow for multi-employer certification and bargaining in an entire appropriate sector and geographic area, as defined by the OLRB (e.g., all hotels in Windsor or all fast-food restaurants in North Bay). The model would be a master collective agreement that applied to each employer’s separate place of business, like the British Columbia proposal, but organizing, voting, and bargaining would take place on a sectoral, multi-employer basis. Like the British Columbia proposal, this might perhaps apply only in industries where unionization has been historically difficult, for whatever reason, or where there are a large number of locations or a large number of small employers, and, perhaps only with the consent of the OLRB. The following could be the technical details. a. A sectoral determination by the OLRB would precede any application for certification. b. To trigger a sectoral determination by the OLRB, itself a serious undertaking, a union (or council of unions), would have to demonstrate a serious intention and commitment to organize the sector, including a significant financial commitment. c. The OLRB would be required to define an appropriate sector, both by industry and geography, or could find that there was no appropriate sector. All interested parties could make representations on the appropriateness of the sector (e.g., all hotels in Windsor, or all fast-food outlets in North Bay). d. Employers in the sector would be required, at some stage of the sectoral proceedings, to produce employee lists to demonstrate the scope of the proposed sector and the union’s apparent strength, or lack thereof. e. A secret ballot vote and a majority of ballots cast (the current rule) would be required for certification. f. Instead of the double majorities that could be required in the British Columbia model, this model would require only a single majority of employees because, as a result of the certification, all employers in the sector would be covered by the master agreement, whereas in the British Columbia-based proposal, almost by definition, there would be a non-union portion of the sector. g. In the special case of an application for an entire sector in a large, multi-employer constituency, given the difficulties inherent in determining an accurate constituency as of any given date and, therefore, whether a numerical threshold to trigger a vote has been met, the union(s) in this model would not be required to meet a numerical threshold to be entitled to a vote. Rather, to be entitled, the union(s) would be required to persuade the OLRB that it had significant and sufficient broad support in the sector. The union would have the obligation to make full, confidential, disclosure to the OLRB, as is required now, with respect to its membership evidence, including all of its information on the size of the unit, the number of employers, etc. Any effort to misrepresent the size of the unit could lead to the dismissal of the application. h. Cards could be signed electronically, with the same safeguards now used by the OLRB for mailed membership evidence. i. An OLRB-supervised secret ballot vote would take place electronically. Voters would “register,” at the time they voted, listing their employer, work and home address, last hours worked, etc. The OLRB would have the authority and responsibility to quickly and administratively determine the eligibility of voters, including any status issues, and ensure that only eligible voters voted. j. Such applications could only be brought at fixed intervals, and, if unsuccessful, could not be brought again, either by the same applicant or by any other applicant, for a period of one or two years. k. If the union was certified, the OLRB would have the authority to accredit an employers’ organization to represent the employers and to conduct the bargaining, directing that dues be paid from each employer on a pro-rata, per-employee basis. Will be very interesting to see how employers and also unions react to this model. There’s lots of legal issues that would need to be sorted out in a model like that. If you have time to look at the Report, please pass along any comments using the comment feature. The CWR is accepting submissions on the Report until October 14, 2016.